The year 2012 must be a particularly lucky one for ButterflyCircle member Federick Ho. 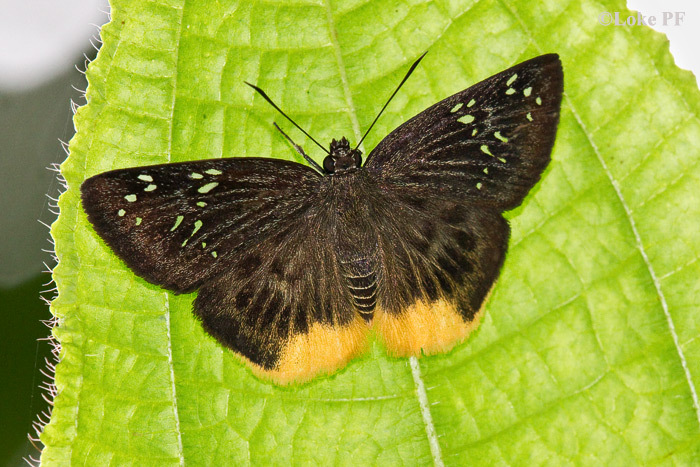 Of the four new species observed by ButterflyCircle members this year, Federick contributed a hat-trick (i.e. 3 hits) to the Singapore Checklist! Spotting new and unrecorded species of butterflies out in the field is a combination of being out at the right time of the day, a pair of sharp eyes, and a matter of being at the right place at the right time, and Federick is doing exactly that so far ! All the four new additions to the Singapore Checklist this year were considered new discoveries, as all four species were not recorded by the early authors in their respective checklists [Ref 1 & 2]. 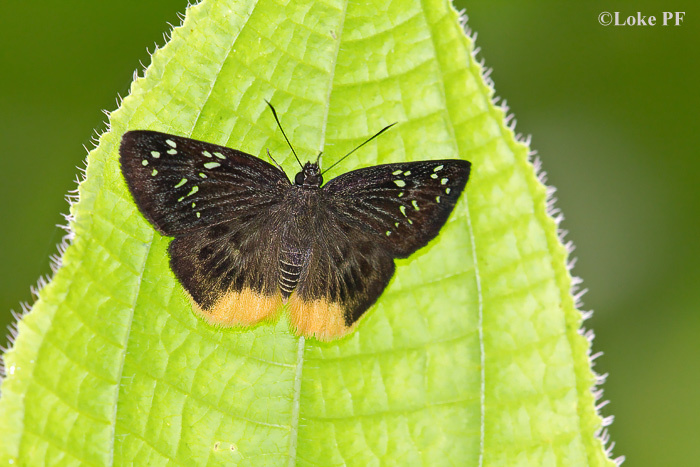 These species are therefore considered new to the Singapore butterfly fauna and it is quite consistent with some of the discoveries from the past years during this period of the north-easterly winds. One theory is that the NE monsoon winds may have carried some species southwards to Singapore from across the Causeway. 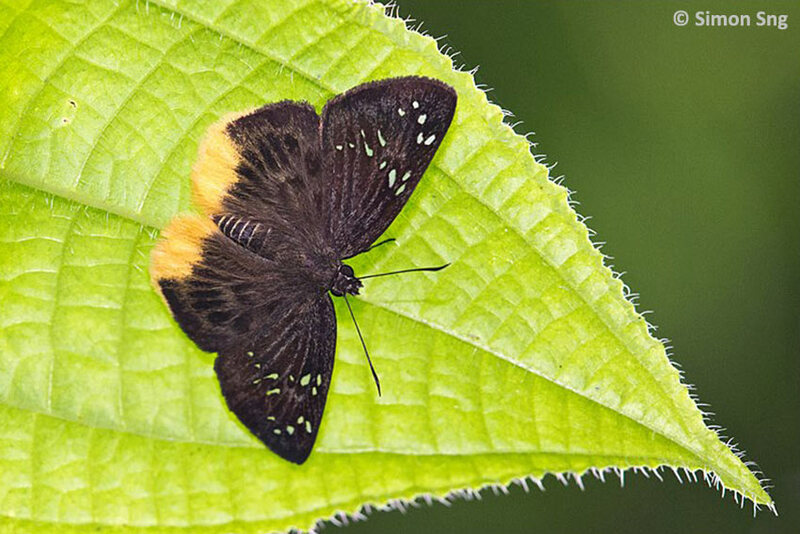 Of course, some of these new finds could already have existed in the less-explored forested areas of Singapore, just waiting for someone to spot them. This morning, a quartet of ButterflyCircle members - Federick Ho, Loke PF, Simon Sng and newbie Huang CJ, were out on their usual weekend butterfly shooting hunt when Federick spotted something that he hadn't seen before in Singapore. He signalled for the rest of the team to hurry to his location, whilst taking shots of his new find. As it turned out, this attractive Hesperiidae from the sub-family Pyrginae (or commonly referred to as the "Flats") known as the Yellow Flat (Mooreana trichoneura trichoneura) has been seen for the first time in Singapore. 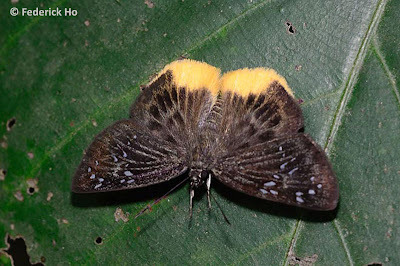 This skipper has not been recorded in Singapore before, and is thus a new discovery. ButterflyCircle records it as species #305 in the Singapore Checklist. 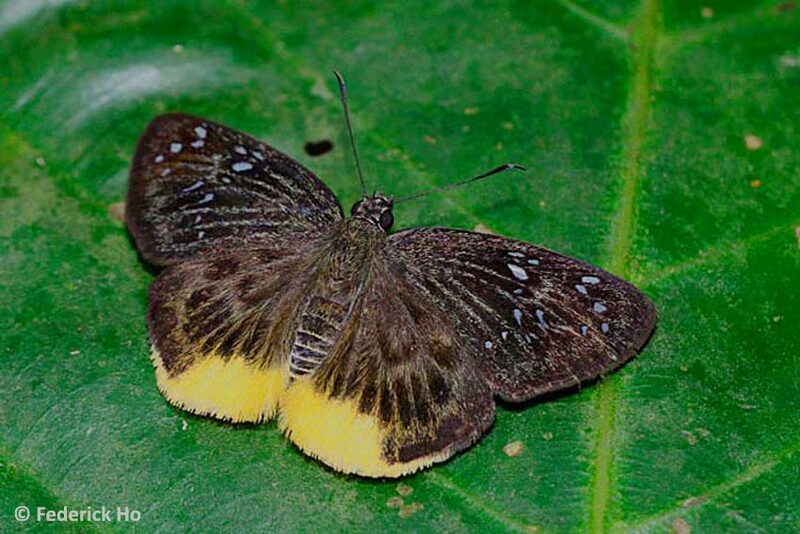 The Yellow Flat is described as a forest-dependent species found in lowland jungles up to 2,500ft. In the males, both the mid- and hind-tibiae feature a hair tuft. Its distribution is relatively wide, stretching from India to Thailand and Malaysia and all the way to the Philippines. The upperside is dark brown with a number of hyaline spots on the forewings. The hindwing has a series of wedge-shaped discal spots and the tornal area is prominently yellow. On the underside, the colours are more muted, appearing as a pale yellowish white. Males and females are similar in appearance. 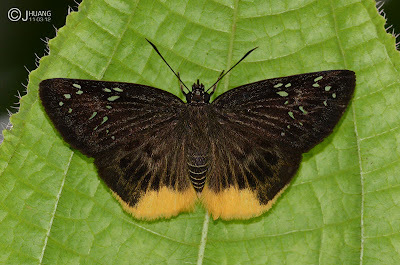 The butterfly has a habit similar to many other members of the sub-family and flies swiftly, often perched on the underside of a leaf with its wings spread open flat. The butterfly is described as "rare on the forested plains in Malaya"
Was the species extant in Singapore all this time? Or is it a newcomer "foreign talent" that had just migrated into the forests of Singapore? This rather pristine individual spotted this morning suggests that the species was not one that had travelled far as it showed relatively little wear and tear on its wings. Whatever its origins, we welcome another new species to our sunny little island. And we hope that Federick's lucky streak will continue! Butterflies of Thailand, Pisuth Ek-Amnuay, 2nd Edition, Amarin Printing & Publishing, 2012.